Colonel Trent Winters was the wealthy owner of a twelve-hundred-acre sugar cane plantation on the banks of the Mississippi River in the 1850s. He and his wife Collette lived in a beautiful, large plantation home. This successful operation was fueled by dozens and dozens of slaves. Trent and Collette suffered the loss of baby Trent, Jr., and she could not continue a loving relationship with her husband, leading both into other relationships. The lives of the slaves are depicted primarily by the stories of two slaves – Amana, who was recently moved from the hot fields to become a house slave; and Tabari, who struggled with his loss of freedom. 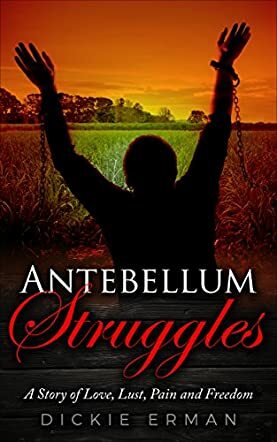 In Antebellum Struggles: A Story of Love, Lust, Pain & Freedom in the Deep South, written by Dickie Erman, the diverse lives of slave owners and slaves are aptly portrayed. From the cruel and horrific conditions on the ships, to the daily routines of being owned by another human being, this book paints a realistic picture of this abhorrent practice. Through the stories of Amana and Tabari, the author has given two varying aspects of the life of slaves. There is no indication that Amana ever considered finding her freedom, while Tabari was willing to put his life at risk to find his. The depiction of the underground railroad was accurate, and the risks that some good-hearted people took were admirable indeed. Author Dickie Erman describes many aspects of slavery in the United States in his novel, Antebellum Struggles. It portrays the complexities of a sad time in American history.